What expectant women should know about working out. Women who sweat it out during pregnancy will likely have a sweet reward at the end, according to a new study. Researchers in Spain found that women who exercise just three times per week during pregnancy have a shorter labor. In the study, a group of around 500 women were divided into two groups. One group of women were led in sessions of moderate exercise by a professional three times per week, based on an exercise regimen recommended by the American Congress of Obstetricians and Gynecologists (ACOG). 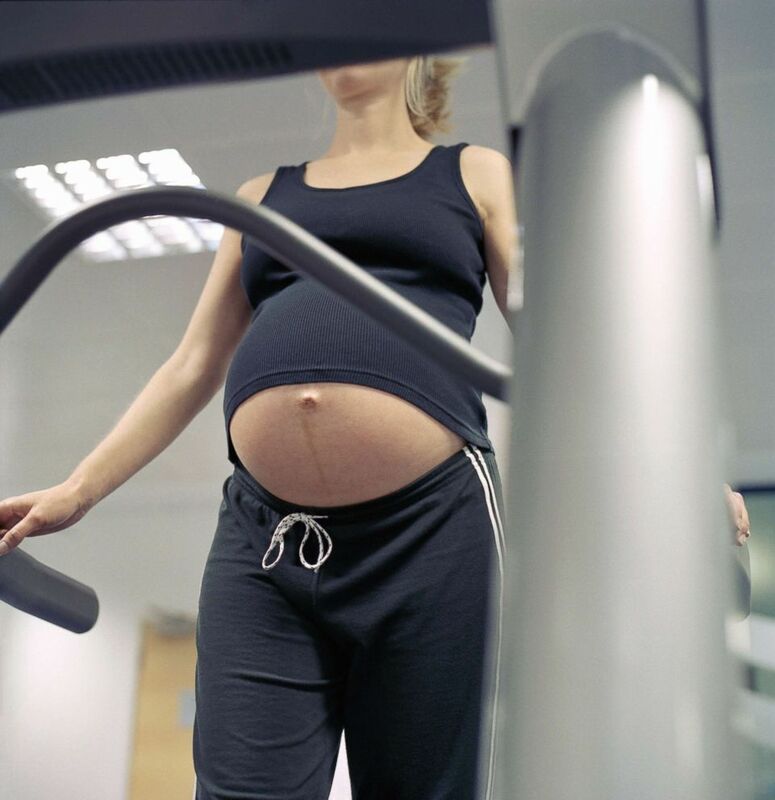 (STOCK PHOTO/Getty Images) A pregnant woman exercises at a gym in this undated file photo. The other group of women had no intervention, just routine education about nutrition and physical activity during prenatal checkups. In the labor room, there was a measurable difference. The first stage of labor -- the beginning of labor to full opening of the cervix -- was an average of 53 minutes shorter for women in the exercise program. It wasn't just the first stage of labor that was affected. The women who exercised had a total labor time that was an average of 57 minutes shorter than the women not led in exercise. (STOCK PHOTO/Getty Images) A pregnant woman works out in this undated file photo. The women in the exercise group were also less likely to get an epidural, according to the study, published in the May 2018 edition of The European Journal of Obstetrics and Gynecology and Reproductive Biology. Another difference the researchers noticed was the women in the group who were just given nutrition and exercise advice reported higher weight gain during pregnancy. Pregnant women should get at least 150 minutes of moderate-intensity aerobic activity every week, according to guidelines from the Centers for Disease Control and Prevention (CDC). In addition to the shorter labor benefit found in the study, exercising during pregnancy may also help decrease the risk of gestational diabetes, preeclampsia and cesarean delivery, reduce back pain, strengthen heart and blood vessels, and give other benefits, notes the ACOG. (STOCK PHOTO/Getty Images) A pregnant woman sits on a fitness ball in this undated file photo. Women should first speak with their obstetrician or other health professionals about exercise during pregnancy, recommends both the CDC and ACOG. Women with certain types of heart and lung diseases, cervical insufficiency, placenta previa, risk factors for preterm labor, severe anemia and preeclampsia should not exercise, according to the ACOG. The intensity of a workout depends on your level of physical fitness before becoming pregnant, according to experts. Women who are very active before pregnancy can maintain the same intensity of workouts with their healthcare professional’s approval, says the ACOG. Dr. Najibah Rehman, MD, MPH, is a third-year preventive medicine resident at the University of Michigan, working in the ABC News Medical Unit.